Posted on Tue, Apr 3, 2012 : 9:35 a.m. The planned Noodles & Co. restaurant is officially on its way to Ann Arbor's west side following a 10-0 vote Monday night by the City Council. The approved site plan calls for demolishing the former Sze-Chuan West restaurant — a 4,300-square-foot building at 2161 W. Stadium Blvd. — and constructing a 2,679-square-foot building with a reconfigured parking lot, outdoor patio and additional landscaping. Sze-Chuan West closed last year. The proposed site of Noodles & Co. 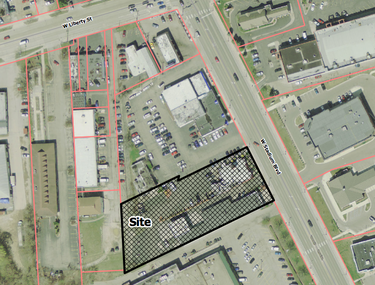 The existing building is on the same parcel as the Big M car wash at 2151 West Stadium and a land division is under review to divide the two parcels. The 1.15-acre site is located on the west side of West Stadium just south of Liberty. According to a planning staff report, the existing restaurant was constructed in 1962. A site plan for a 570-square-foot addition was approved in 1973 and constructed in 1974. The proposed single-story building will rise 22 feet, which is less than half the four-story or 55-foot maximum allowed under the C3 zoning. The existing site has 24 automobile parking spaces and no bicycle parking spaces. The site plan calls for 27 automobile parking spaces and four bicycle parking spaces. Bicycle lanes were added to West Stadium in front of the site as part of improvements completed in the summer of 2006. A 15-foot by 40-foot patio will be located along the front of the building. There also will be a 10-foot-wide landscaped area between the patio and the sidewalk along West Stadium. Noodles & Co. already has locations on Washtenaw Avenue near US-23 and on South State Street in downtown Ann Arbor. Council Member Marcia Higgins, D-4th Ward, was absent. Wed, Apr 4, 2012 : 8:03 a.m.
Why does the &quot;highlighted&quot; site include the Big M car wash? Are they going to tear that down too, or is that a mistake oin reporting? I suppose it would give A2 city council a reason to get rid of yet another cool retro neon sign. Seriously going to miss the old building. A better run restaurant could have had a lot of fun with that interior! Its in the body of the story. The entire parcel is currently the restaurant and the car wash, one of the things on the table is to bifurcate the property and split the two onto separate parcels. Tue, Apr 3, 2012 : 11:30 p.m.
Tue, Apr 3, 2012 : 11:08 p.m. Someone wants to take down an old building, build something that will create construction jobs and jobs for employees and all you people want to do is run them down? Plus this isn't another U of M Palace, these people will actually pay taxes too. Plus their food is good. Tue, Apr 3, 2012 : 10:15 p.m.
Next door at Bell's Diner has the best bi bim bop on the west side. Wed, Apr 4, 2012 : 1:43 a.m.
Amen. Also, Izzy's across the street makes great sandwiches. There are still a few good independent joints on W. Stadium. Tue, Apr 3, 2012 : 9:32 p.m. I love the West Side and Stadium Blvd for the good parts, like Stadium Hardware, Arbor Farms, Ace Hardware, Bank of Ann Arbor, and Westgate with TJMaxx and Nicola's and Star's Cafe. We got a lot going on over here. A few noodles will not be ruining our day. I know I am leaving out lots of great spots that I have not discovered yet. Tue, Apr 3, 2012 : 9:31 p.m.
Tue, Apr 3, 2012 : 9:29 p.m.
What a joke this city has become - very overrated restaurants with average food or chains. Noodles and Co. is great for students on cheap budgets but I wont' spend my money there. there are a few good restaurants but at higher end of price range. What happened to going out for decent food and enjoyable night out? Between tshirt stores and chain restaurants, and above mentioned so so restaurants, I am not sure what the appeal for folks to really spend their dollars here. Wed, Apr 4, 2012 : 12:24 a.m.
Tue, Apr 3, 2012 : 8:44 p.m.
Tue, Apr 3, 2012 : 6:10 p.m.
Where can I get a $30 Sze-Chuan West retro t-shirt? Tue, Apr 3, 2012 : 5:52 p.m.
Too bad they'll bulldoze that unusual building, I remember when it was the Waterfall restaurant...had a beautiful neon sign. I'd much rather see an independent business on the site too, but Stadium has long been dominated by suburban chain stores. The only chain store I miss on that stretch was the A&amp;W, a throwback to a different era...so sad when it closed. Wed, Apr 4, 2012 : 12:49 a.m. So, how many unique local businesses have you opened? Tue, Apr 3, 2012 : 8:45 p.m.
&quot;Suburban chain stores&quot;... right here in Edge City! Tue, Apr 3, 2012 : 5 p.m. Wed, Apr 4, 2012 : 12:07 p.m.
@Hmm...where will you be eating? Catbehindthecouch and I will wave as we enjoy our very tasty and fresh noodles dishes. This place will be a welcome addition to our neighborhood -- so glad it's coming!! Tue, Apr 3, 2012 : 9:19 p.m. In a related story... No one cared. Tue, Apr 3, 2012 : 7:31 p.m.
Tue, Apr 3, 2012 : 6:09 p.m. I will. Thanks for sharing. Tue, Apr 3, 2012 : 4:35 p.m. Sad to see sze chuan go. as a child, I always thought of it as the fred flintstone cave. Tue, Apr 3, 2012 : 2:57 p.m.
Actually - I miss Sze-Chuan West - I liked the funky cave and if they had kept their quality up they still would be one of the best Asian food haunts in AA. Tue, Apr 3, 2012 : 9:03 p.m.
@ jgold47 - thanks for the info - I've got business that way next week and will check them out! Tue, Apr 3, 2012 : 8:35 p.m. I just ate at Sze Chuan for the first time recently, possibly the best Chinese food I have ever eaten! Tue, Apr 3, 2012 : 7:18 p.m. I find it very critical to point out that the original owners (or at least the owners through my lifetime) sold this location a few years before it went downhill. Different owners, differnet quality and menu. The original owners still have a Sze Chuan in Canton on Ford Rd (the original I surmise, as this was Sze Chuan West), with the same menu and the same amazing food. Made my day when I found out they were the same people. Tue, Apr 3, 2012 : 3:52 p.m.
Wow, wonderful.... Another disgusting chain on stadium.. Wed, Apr 4, 2012 : 12:22 a.m.
What about the good ole days? McDonalds across from Big Georges, Fowlers N.E. corner of Stadium and Liberty, Stadium Tavern N.W. corner of Stadium and Liberty. Everetts where Taco Bell is, A&amp;W across from where subway is? Noodles &amp; Co. is better than whats there now! If you are not happy there is a simple solution. Invest YOUR OWN money! And stop complaining! Tue, Apr 3, 2012 : 5:02 p.m.
&quot;a2miguy It's not like that part of Stadium was ever going to be beautiful. Might as well make it chain city.&quot; Wish it was a Wendy's instead of Noodles and Co.
Tue, Apr 3, 2012 : 2:52 p.m. Yes, I can see how disappointing that must be, since West Stadium has traditionally been an area of unique and independent local businesses, like McDonald's, Taco Bell, Burger King, KFC, Sunoco, Goodyear Tires, etc. I'm still mourning the loss of La Pinata. Tue, Apr 3, 2012 : 2:07 p.m. It's not like that part of Stadium was ever going to be beautiful. Might as well make it chain city.